With the trade of Nomar Garciaparra from the Boston Red Sox to the Chicago Cubs, one of American sport's most uncomfortable marriages finally ended in separation. Garciaparra had become a Boston icon since joining the Red Sox in 1996, but he clearly never enjoyed the pressure and scrutiny that comes with playing in America's most baseball-crazed city. The people and press of Boston eat, sleep and breathe Red Sox baseball, and Garciaparra was far too sensitive to last a full career there. Though Red Sox supporters showered him with adoration on and off the field, he would rather be in a place where he could simply play baseball and then be left alone. That simply does not happen in Boston. 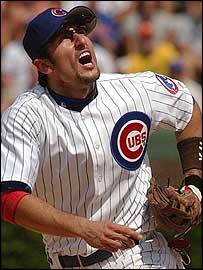 Perhaps Garciaparra will find happiness in Chicago, where Cubs supporters are far more relaxed. The trade will be a big boost on the diamond for the Cubs, who now have a superb bat to join the likes of Sammy Sosa and Moises Alou in the line-up. The Red Sox did not get fair market value for Garciaparra, acquiring outfielder Dave Roberts, shortstop Orlando Cabrera and first baseman Doug Mientkiewicz, but the trade was mainly about getting rid of their unhappy shortstop. There was a slight sense of "Oh no, here we go again" when the US Basketball team's first official game began with three of its young stars sitting on the bench in street clothes. However, the US should not be discouraged but rather encouraged by coach Larry Brown's early show of discipline against Allen Iverson, LeBron James and Amare Stoudemire for missing a team meeting the night before the game. Keep in mind the 2002 World Championships, where previous US head coach George Karl lost all control of his players and could not motivate his team to perform the simplest of tasks. The national team's sixth-place finish at that competition was an embarrassment. Brown appears determined not to repeat Karl's errors, and all America should be thankful for that. European football continued to make a push for American fans with the Champions World Series tour from 24 July-3 August. Though the friendlies between some of Europe's football giants may not have made much of a ripple in the mainstream US media, the crowds at the matches suggest the popularity of football is on the rise stateside. The biggest crowd came on 31 July, when some 74,000 supporters jammed into Giants Stadium in New Jersey for the match between Manchester United and AC Milan. New York City got a glimpse of what all the fuss was about the next day when supporters crowded the area around Macy's department store in midtown Manhattan for a look at AC Milan's new kit. Even that most American tradition - throwing out the ceremonial first pitch at a baseball game - took a European twist when Milan's Alessandro Costacurta did the honours at Yankee Stadium for Baltimore's visit.